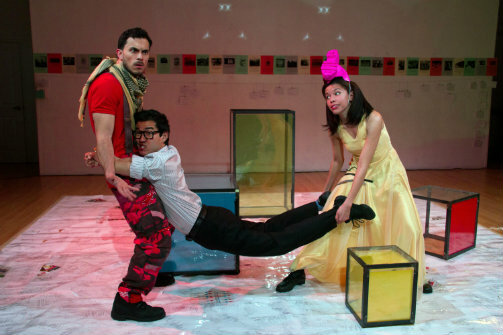 BOTTOM LINE: A meta-narrative identity play about immigration with dreamlike imagery. When you enter University Settlement’s second floor performance space, the first thing you are greeted with is a question. That question is like a little rain cloud that follows you throughout the entire evening. And at first it might seem like a simple answer, but as you watch Koung Park’s TALA unfold, you discover that there are people who cannot answer that question so easily. The question asks when and where your parents immigrated to America. Kyoung Park’s semi-autobiographical identity play TALA constantly revolves around the question and problem of immigration in America. What we watch is a Korean-Chilean playwright named Kyoung (Daniel K. Isaac) trying to write a play about two lovers (Rafael Benoit and Flor De Liz Perez) inspired by the poetry of Pablo Neruda and Gabriela Mistral. The lovers venture through a dark war-torn landscape, both with contrasting viewpoints of what is actually unfolding around them. However, the lovers’ narrative keeps getting interrupted by the real-life drama which unfolds around Kyoung concerning his immigration status. Park has fun letting his dramaturgical persona invade the narrative of the lovers, which would seem like a somewhat straight-forward poetic love story with a dash of revolutionary wisdom sprinkled about. Isaac rolls around on an office chair clutching a colored lamp while a live-feed projects his face against the back wall, informing us in hushed paranoiac tones that he’s been placed on a watch list and that he might be kicked out of school because of 9/11. The fear is palpable for our hero and one can see why the playwright would be unable to finish the lovers’ narrative. I wondered why Park focused so heavily on the lovers when it seems his story is the one he needs to tell. In fact, the meta-narrative of TALA is actually two plays linked together only by its author. The themes and ideas of both plays exist as separate entities on their own. And while I think both stories are interesting (I was especially struck with Kyoung’s journey from NYU to Korea), I couldn’t quite grasp the need to link them together. That said, it didn’t distract from my enjoyment of the piece. This is a play of ideas and poetry collaged together; at times, it felt dream-like with its fluid, animal-like choreography by Yin Yue and music by Svetlana Maras. The sparse set by Jason Krugman suggested the idea of a modern installation piece you might find in a warehouse in Williamsburg. And the trio of performers -- a breathe of fresh air to see such diversity on stage -- were all impressive, especially when they switched into different roles. At one point, all three performers inhabit the persona of Kyoung (Benoit’s is particularly heartbreaking to watch) and the fluidity of that role-switching fits nicely with the overall messy journey of uncovering identity. Personally, the question that lingers from the beginning is a question that haunts me to this day. I do not know who my father is and I am missing that part of my lineage. And while I watched other audience members easily answer the question in detail, I was unable to even venture a guess, which made me relate to Park’s play on a level that I don’t think he could have anticipated. Throughout the play, I felt the overwhelming feeling of being an outsider, which Kyoung echoes with every line. But sometimes that outsider feeling, which can often feel empty, when shared in a performance setting, can feel quite cathartic.